How about that Al Gore? The “Thinking Man’s Thinking Man” and the “Eco-Prophet” (as dubbed by Newsweek last month.) 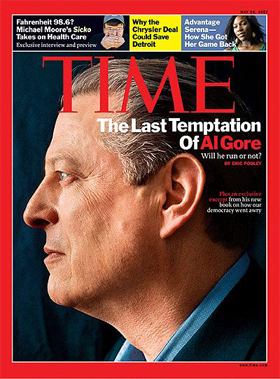 Or Al Gore the Christ (Time magazine’s implication in May 2007). Attention fawning media outlets: your environmental savior with the supposedly high-octane intellect is looking rather shabby. I mean, an intellectual researches things a tad before making public pronouncements, doesn’t he? So what are we to make of the interview Mr. Gore gave to Slate magazine four days ago? He was asked about the 1,073 e-mails that comprise part of the ClimateGate documents leaked/hacked last month. These e-mails reveal prominent climate scientists discussing amongst themselves oh-so-unscientific behavior like evading Freedom of Information requests, deleting select e-mails, and boycotting journals that publish articles they disagree with. The e-mails are listed here, 25 to a page. There’s nearly 10 full pages from the last two years alone. 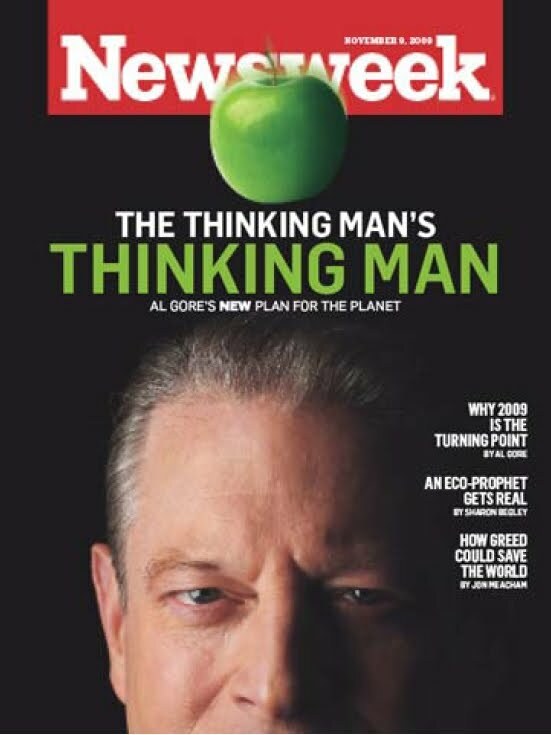 The most recent one, rather than being written a decade ago as Mr. Gore claims, was authored less than four weeks before the Slate interview. There’s a website out there called AlGoreLied.com. Honestly, I think its name is unfortunate. I prefer to believe that people make mistakes, that they get carried away in the heat of the moment, that their mouths overtake their brain on occasion. I think it’s rude to accuse someone of being a liar. But if Mr. Gore isn’t intellectually impaired and he isn’t an outright liar what are we left with? Option A: He’s a salesman. He apparently doesn’t care whether his remarks are accurate. He appears not to have read these e-mails and seems unlikely to do so. For him, facts are beside the point. Mr. Gore may simply be interested in selling stuff: his books, his film, his speeches ($175,000 per) and his photo standing beside you (for the equivalent of $1,200). And let’s not even talk about the various green ventures in which he’s financially involved. That’s not the kind of milieu that keeps one sharp. Once you’ve been declared the “thinking man’s thinking man” maybe you start to believe that any assertion that comes out of your mouth will be treated like gospel, so why sweat it. It seems to me the mainstream media now faces a choice. It can start doing its job – which used to be understood as helping ensure the little folk aren’t victimized by wealthy, powerful, famous ones pushing schemes designed to enrich themselves. It can start writing stories that represent the checks and balances the press is supposed to supply in a democratic society. Or it can carry on being the public relations arm of I-can’t-be-bothered-to-get-basic-facts-right politicians like Al Gore. In that case, the sooner such “journalists” are relegated to the dustbin of history the better. This entry was posted on December 12, 2009 by Donna Laframboise in Al Gore, climate bible, climategate, IPCC, media and tagged al gore, climate bible, climategate, Intergovernmental Panel on Climate Change, IPCC, Katie Couric, media, Newsweek, Slate.com, Time magazine.